Governor Signs Historic Pro-Life Legislation and TX Bishops Thank All Who Heeded the Call! To build a culture of life, we need saints! 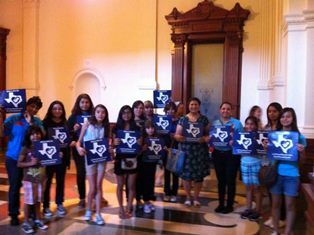 Two weeks of awe-inspiring activity among Texas Catholics and other pro-life advocates culminated late Friday with the Texas Senate passing House Bill 2, the Omnibus Pro-Life Bill, by a vote of 19-11. The vote followed an equally decisive 96-49 vote taken by the House of Representatives on Wednesday. . . . The Texas Catholic Conference must thank so many legislators for standing their ground and standing up for the lives of the unborn and the health and safety of Texas women. . . .
Gov. Rick Perry today was joined by Texas legislators to stand for life and sign House Bill 2, which protects unborn babies after the fifth month of a pregnancy and raises standards for women's health care in Texas. If you haven't already, please take a moment to contact your legislators (voting record here), as well as Governor Perry and Lt. Governor Dewhurst to thank them for their courageous stand4life! This powerful documentary tells the stories of abandoned and trafficked girls, of women who suffer extreme dowry-related violence, of brave mothers fighting to save their daughters’ lives, and of other mothers who would kill for a son. A Q & A will follow the film, featuring the President of Women's Rights without Frontiers Reggie Littlejohn. Tickets are $10 and available here. Only a few tickets left! Organizers said they are expecting at least 2,000 participants will be in attendance for the third Hispanic Congress of the Americas for Pro-Life and Evangelization, a three-day event set to take place at the Plano Centre Aug. 16-18. The bi-annual event, which is organized by the Catholic Pro-Life Committee, is open to the public and will feature prominent cardinals, bishops and lay speakers from across the country. On the same day as Texas Gov. Rick Perry signed the state's new late-term abortion ban into law, Planned Parenthood has announced that they are closing three more clinics in the state, one of which performs abortions. In a press release, Planned Parenthood blamed the closures on funding cuts that Republican lawmakers passed in 2011. Those funding cuts have already led to the closure of numerous Planned Parenthood clinics across the state. However, one of the three clinics, the Bryan clinic, is also subject to the requirements of the new abortion law. Abortion advocates have said that the law could close as many as 37 of the state's abortion facilities. Continue One of three clinics closing is where pro-life leader Abby Johnson once worked as director. Why are the Philippines, Malta, Costa Rica and now Ireland succumbing to the population control mentality and anti-religious sentiment? . . . The process has been slow but successful. Even a short time ago, it seemed unimaginable that a country like Ireland would abandon its ardent defense of life in order to follow the “new way”; that Mexico City, under the watchful gaze of Our Lady of Guadalupe, would legalize abortion (up to the twelfth week) or that Costa Rica would legalize in vitro fertilization.